New Delhi: Prime Minister Narendra Modi will observe a day-long fast on Thursday along with all members of Parliament (MPs) of the ruling Bharatiya Janata Party (BJP) to protest against the recent washout of the second half of the budget session of Parliament. The ruling National Democratic Alliance (NDA) has blamed the opposition led by Congress party for the washout. 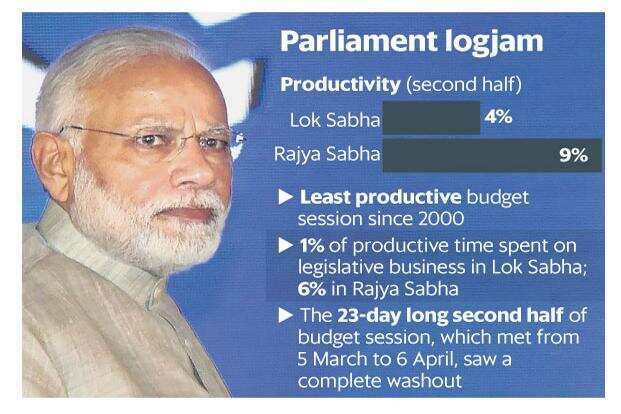 The budget session was the worst session in terms of productivity in the last 18 years. “Prime Minister Narendra Modi will observe a day-long fast on 12 April but he will continue with his official engagements. He will continue to clear the files and hold regular meetings," said a senior BJP leader aware of the plan. BJP president Amit Shah will hold a meeting in Hubli, Karnataka, to protest against the state’s Congress government. Speaking at centenary celebrations of Mahatma Gandhi’s fast at Champaran in Bihar on Tuesday, Modi alleged that opposition parties were creating hurdles for the NDA while it was working for the upliftment of financially weaker sections. “From the streets to Parliament, roadblocks are being created in the government’s work. While the government is working towards uniting people and their hearts, some opponents are working towards breaking up society," said Modi. Without naming any political party, Modi said there are people who don’t want any improvement in the condition of the poor as they feel it would become difficult to mislead financially weaker sections if the government succeeds in its efforts to uplift the poor. Modi also reiterated the need to end the menace of caste, religious differences and corruption, and said that these issues were affecting society and weakening the country. “We have to eradicate the problems affecting our society which are weakening the country. We have to build a new India which is free from corruption, caste differences and religious divide. The entire country is one big family, we have to work together, only then we would be able to pay respects to the people who fought for the independence of the country," Modi said. Modi’s remarks come at a time when the country has witnessed protests by Dalits against the alleged dilution of the Scheduled Castes and the Scheduled Tribes (Prevention of Atrocities) Act. Several organizations working for the rights of Dalits organized a nationwide protest on 2 April. The Prime Minister also praised the Bihar government under chief minister Nitish Kumar and said the state government would never compromise on corruption and would continue making honest efforts for the betterment of the people.